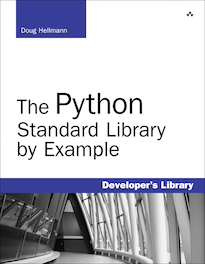 The shelve module implements persistent storage for arbitrary Python objects which can be pickled, using a dictionary-like API. The shelve module can be used as a simple persistent storage option for Python objects when a relational database is overkill. The shelf is accessed by keys, just as with a dictionary. The values are pickled and written to a database created and managed by anydbm. The dbm module does not support multiple applications writing to the same database at the same time. If you know your client will not be modifying the shelf, you can tell shelve to open the database read-only. If your program tries to modify the database while it is opened read-only, an access error exception is generated. The exception type depends on the database module selected by anydbm when the database was created. Shelves do not track modifications to volatile objects, by default. That means if you change the contents of an item stored in the shelf, you must update the shelf explicitly by storing the item again. In this example, the dictionary at ‘key1’ is not stored again, so when the shelf is re-opened, the changes have not been preserved. To automatically catch changes to volatile objects stored in the shelf, open the shelf with writeback enabled. The writeback flag causes the shelf to remember all of the objects retrieved from the database using an in-memory cache. Each cache object is also written back to the database when the shelf is closed. Although it reduces the chance of programmer error, and can make object persistence more transparent, using writeback mode may not be desirable in every situation. The cache consumes extra memory while the shelf is open, and pausing to write every cached object back to the database when it is closed can take extra time. Since there is no way to tell if the cached objects have been modified, they are all written back. If your application reads data more than it writes, writeback will add more overhead than you might want. The examples above all use the default shelf implementation. Using shelve.open() instead of one of the shelf implementations directly is a common usage pattern, especially if you do not care what type of database is used to store the data. There are times, however, when you do care. In those situations, you may want to use DbfilenameShelf or BsdDbShelf directly, or even subclass Shelf for a custom solution. 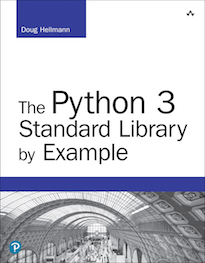 Standard library documentation for this module. The feedcache module uses shelve as a default storage option. Shove implements a similar API with more backend formats. Other mechanisms for storing data using standard library modules.